“The main problem in America today isn’t voter fraud, but widespread voter suppression, most often conducted by Republican officials. We see it at work in North Dakota, where thousands of Native American voters are being disenfranchised by targeted technical requirements. We see it in Kansas, where Secretary of State Kris Kobach, who happens to be running for governor, has eliminated the one polling place in majority-Hispanic Dodge City, forcing the city’s residents to go to elsewhere to vote. This is the same Kris Kobach who spearheaded President Trump’s “election integrity” commission, which was disbanded after finding no supportive evidence of widespread voter fraud. We see it in Georgia, where some 53,000 voter registrations, more than 70 percent African American, have been put on hold because of minor errors best described as typos and 340,134 voter registrations were incorrectly purged by Secretary of State Brian Kemp — who also happens to be running for governor. Voting is a fundamental right that should be encouraged rather than discouraged, no matter which party is in charge. 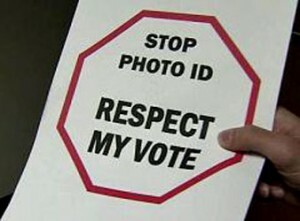 If any provision should be added to our constitution, it should be an amendment establishing the right to access the proper ID, with minimum effort and no cost, for all legitimate voters. Voter suppression should not be cemented into our state constitution. We need more participation in our democracy, not less.